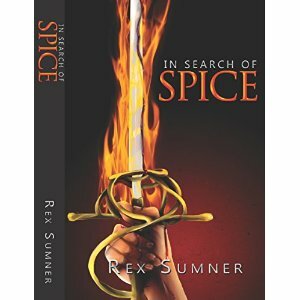 “In Search of Spice,” by Rex Sumner, is a book that brings together historical fiction, romance, and fantasy to create a story filled with action, adventure, relationships, and endearing characters. The story follows the voyage of a carrack searching for the storied land of Hind, rumored to be rich with spices. The journey takes crewmembers to a variety of beautiful lands, meeting a variety of very different people along the way, from friendly to hostile to mysterious. Sumner does an excellent job capturing the essence of “culture.” Although the book is fiction, the descriptions have a historical feel to them, bringing a layer of realism to the book. The maps are also a nice touch, making it easier to follow the voyage as you read. My favorite aspect of the book, however, is the eclectic cast of characters, especially the strong female characters. Sumner develops all of his characters, even minor ones, my favorite being the intelligent, determine Hinatea. I'd recommend“In Search of Spice" to anyone who likes books that transcend genre and have strong characters.